My sister-in-law approached me a while back to ask if I'd help her spread the word about a project she is involved in. She knew I might be interested, because the project benefits homeless youth, a subject I address in my Worth the Effort series. One of the reasons I chose to tell Ayden's Story is because I feel it is VERY important to 1) expose people (especially teens) to the fact that there are homeless kids and 2) let people know there are so many different reasons kids end up on the streets. The underage homeless population is exceptionally vulnerable and really flies under the radar. So when Dianne approached me, I jumped on the chance. I'll repeat: There are so many reasons kids end up on the streets. Dianne Hartsock is here to share some with you, along with the anthology project she's a part of. Since it is RELEASE DAY for the anthology, we're among the first to hear about it. Take it away, Dianne. Thank you Kai for having me over! 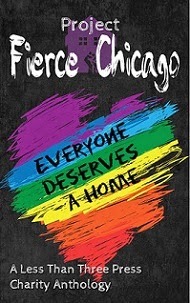 I wanted to talk a little bit about homelessness today and the Project Fierce Charity Anthology, in which I'm very happy to say my story SAMMY is part of. 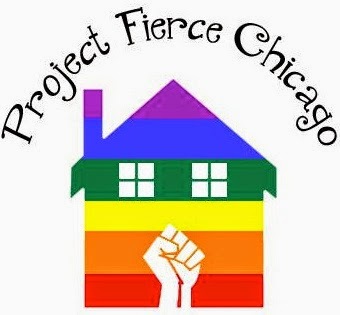 Project Fierce Chicago's mission is to reduce LGBTQ youth homelessness in Chicago by providing affirming, no-cost transitional housing and comprehensive support services to homeless LGBTQ young adults. PFC also aims to encourage community-building and civic engagement through cooperative living and youth leadership development. Homelessness has devastating effects on children. Children that lack stable housing experience chronic stress and trauma from frequent moves, inconsistent relationships, and from witnessing domestic violence. The stress and trauma is physically, emotionally and cognitively damaging to them. Chicago Public Schools identified 2,512 unaccompanied youth attending their schools in 2012-13, teens who were homeless and living without parent or guardian. There are only 360 youth beds in Chicago. Homeless youth face daily challenges while living on their own. They need to secure food and shelter, find a job or return to school. The choices many make in order to survive are often not good for them and can affect their adult life. But the crowded city isn't kind to a young man with no home and no prospects of work. When this story opens, Sam has been on the streets for several years when one of his 'regulars' begins to take more than a business interest in him. For the first time Sammy dreams of more than a bleak lonely future, but does he dare hope that someone like him could find their happily ever after? John tossed his apron in the hamper then slipped out the back of the shelter into the dark alley and hurried around to the brightly lit street in front. Couples were enjoying the last of the day's warmth on the waterfront and he envied them as he headed toward his apartment complex. His pulse sped up as he neared the Morrison Bridge. Though it was after nine, traffic was still heavy on the bridge and also along Naito Parkway. Passing under the bridge, he glanced down the bike path running alongside it, searching for Sammy. His heart leaped to his throat on seeing the familiar figure huddled on the grass, arms wrapped around his knees, looking alone and dejected. John ached to go to him, but would Sam want to talk to him? They weren't really friends. John paid for his company. A soft sob floated on the night air and plunged straight into John's heart. He hurried over to Sam, then stood biting his lips, not sure what to say. "What do you want?" Sammy's voice sounded tired, rough with tears. "Do you need help? Can I do anything?" Sam raised his head, blue eyes shimmering at him through wet lashes. Recognition sparked in the beautiful depths, then they widened. "You." Sam struggled to his feet, hugging his bare arms across his chest against the chill creeping up from the river. "Sorry, I have to cancel on you. I'm closed for the night. Try again tomorrow." He brushed past John and started down the bike path. John's heart thumped painfully. "Sam?" The young man stopped and swiveled abruptly. The lamplight caught his expression, a hint of fear, anger; the light clearly showing a cut lip and the dark swelling of a bruise on his ivory cheek. John clamped his lips shut on a murmur of pity, noting he held his left arm as if it hurt. Helplessness swept through John. "Let me help you. I can make you a cup of coffee at least. And dinner, if you're interested. I make great spaghetti." Doubt crossed Sam's pretty face and the end of his pink tongue nudged the cut on his lip, twisting John's heart. Impulsively, he touched Sam's arm. "Did someone hurt you?" Sam stared at his hand, not answering. John was grateful he didn't yank his arm away. Finally Sam nodded. Anger flashed through John, but he didn't want to scare Sam off with questions. "Come home with me," he urged softly. "I won't ask anything of you. I want to help and… I could use the company tonight." Blue eyes glanced upwards, vulnerable. But then Sam blinked and mischief curled his lips. John winced at his false bravado. "Whatever you say, hon." Sam hooked their arms and started along the wide path following the riverfront. After only a few steps in the chill evening air, John shrugged out of his coat and put it around Sam's shoulders. Sam looked amused but pulled the coat tighter around his thin cotton shirt. "Thanks." John's heart pattered. He liked Sam's arm linked with his. A few people gave them curious glances, but for the most part, they were ignored. He wished the circumstances were better, that maybe Sam was his boyfriend and they were walking home from the movies. They reached his street and his pulse quickened when he led Sam to his apartment. Thinking of so many children/teens with bad home life or no home is sad. I hope stories and books about the situation will open people's eyes and your project will receive the help it needs for these young people. The excerpt is touching. Best of luck. It is sad. Educating people takes away some of their fear of it and that's when they are more likely to take action. Thanks for visiting, Beverly. Thank you for helping me promote this wonderful anthology, Kai! Hugs. Absolutely, Dianne. I'm so very happy to do so! Best of luck with it.